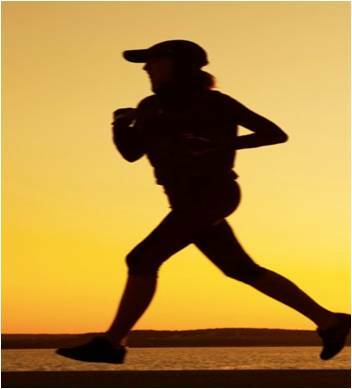 A routine of daily exercise and physical activity are vital to living a healthy and happy life. You will have lower risk of heart disease, colon cancer and type 2 diabetes. Helps you reduce weight and maintain a healthy weight. Builds muscle strength and endurance; it helps to build and maintain muscles, bones, and joints. Aids in controlling blood pressure and cholesterol levels. Improves feeling of well-being and self-esteem. Helps reduce the feeling of depression, anxiety and low self esteem. Exercise is an investment in your health that will pay rich dividends. Everyone should create time for daily exercise- whether at work, home or during weekends. Simple exercises can get you started with physical activity- even for the person with the busiest schedule. Organize your daily and weekly schedule and identify opportunities that can help you become more active. Every little bit of chance helps. Walk, cycle, jog, or skate to work or school. Use the stairs instead of the crane or elevator. Do not sit from morning to evening. Take fitness breaks- walk or do desk exercises- instead of taking tea breaks. Park your car farther away from your office, then walk to the office. If you find it too hard to exercise while at work, try exercising after work. Walk, cycle or jog on your way home. Join your office teams like football, volleyball, basketball and so forth. Take after work classes in dance, lifestyle, or fitness. Stretch, walk on treadmill or stair climber, use hand weights, or ride a stationary bicycle while watching television, or listening to radio. Stand and walk around while calling or talking on the cell phone. To ensure that you are ready for exercise wherever you go, keep a pair of comfortable walking or running shoes in your bag or car. Walk, cycle to the marketplace, shop or your favorite joints. Plan and organize a family-walk or a group-walk on weekends. If you are physically able, clean your house, dust your cabinets, power-wash your siding, or clean your car instead of hiring it out. Perform some sit-ups, push-ups/press ups, and pull-ups. Walk up and down the football, basketball or volleyball field sidelines while watching the children play. Plant a vegetable or flower garden, water it and give other necessary care. Play with the kids - dance to favorite music, splash in a puddle, tumble in the leaves, and teach them other kids’ games. Play soccer, basketball, racket ball, tennis, or squash among other games that you like. To this list add more exercises of your own and then come up with a daily exercise plan. 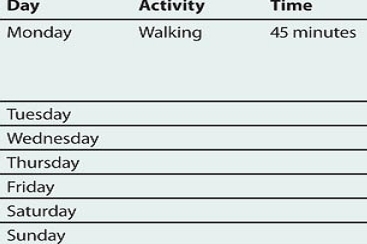 You can have this in the form of a chart with the days of the week and the type of exercise/activity to perform. Have a day's target like- minutes per every activity. Finally assess your self at the end of each day to know how you are performing.